Having a baby is really expensive so it’s a good idea to save as much money as possible whenever you can. 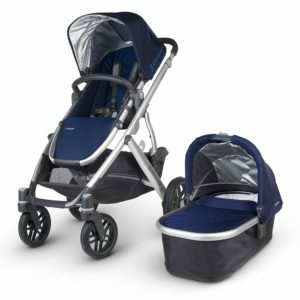 I’ve put this page together to help save you guys some money because strollers can be a high ticket purchase. The 18% discount is valid for almost all products (some exclusions apply such as already discounted items). 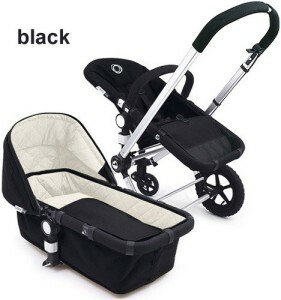 They also stock a great variety of baby products, not just strollers. This offer is only valid for US customers. 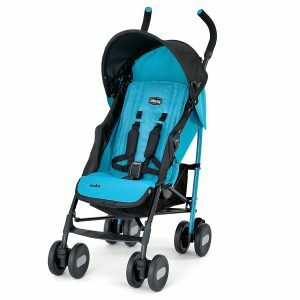 Save 20% on Uppababy 2016! 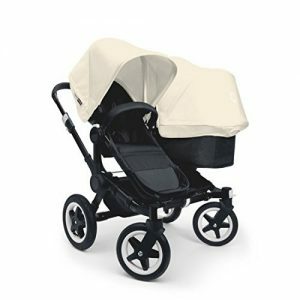 Save 20% off the Bugaboo Bee3! You have your new baby and decided to buy a baby stroller. You find yourself walking more and you want to get back into shape again. But your little baby has to remain close. How do you get fit again and have an exercise routine that accommodates your baby too? Well now you can. You can take your baby along for the ride in the stroller and set up an exercise routine that will help you lose weight and quickly get back into shape again. Try to exercise at least three times per week if possible. Advise your doctor that you intend to start exercising just to ensure that everything is OK. If in doubt, have your doctor perform a medical before undertaking any exercise program. The aim of these exercises is to incorporate your baby stroller as part of your exercise equipment. However, feel free to bring along any other exercise equipment that you like using e.g. weights, stretching bands, skipping ropes etc. This exercise program is intended to take 20 minutes but as you get fitter, you can extend this time period. Regardless of how long the exercise is, it is important to get your heart rate up. You can easily find your Target Heart Rate (THR) with this very simple method. Subtract your age from 226 (220 for men) to calculate your Maximum Heart Rate (MHR). 50 – 60% of maximum heart rate: The easiest zone and probably the best zone for people just starting a fitness program. It can also be used as a warm up for serious walkers. This zone has been shown to help decrease body fat, blood pressure and cholesterol. It also decreases the risk of degenerative diseases and has a low risk of injury. 85% of calories burned in this zone are fats. 60 – 70% of maximum heart rate: This zone provides the same benefits as the warm up, but is more intense and burns more total calories. 85% of calories burned in this zone are fats. 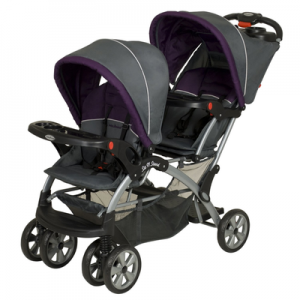 5 minute walk with your baby in the stroller to loosen the muscles. When you get good at curb step-ups, you may want to make the exercise harder and this is a good way to increase the effort required. This will take about 5 minutes. Spend approximately 20 seconds stretching each muscle. This will prevent your muscles from stiffening up and causing you pain later. Never take your hands off the stroller. 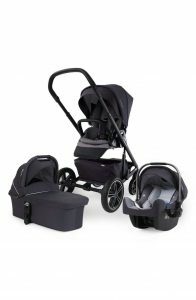 The jogging stroller is designed to roll with as little resistance as possible, making it very easy for it to get away from you. Don’t forget to consider your baby’s exposure to the elements. Use sunscreen and hats to block the sun (even in non-summer months). Use extra clothes in cold and damp weather. Remember, your baby isn’t generating any extra body heat and he/she has the wind created by your speed to deal with. Don’t let your guard down on safety. Although the jogging stroller provides a convenient way for you to get out the door and run, the advantages don’t come without risks to your infant. Stay vigilant and your exercise can be satisfying and safe for both you and your new companion. Stay focused: Leave your iPod and dog at home. Make this time simply about you and your baby. Choose a good time — do not run at night when visibility is poor or when your baby is irritable and will distract you. This whole routine takes 20 minutes (excluding warm up and cool down). Anyone can get fit in 20 minutes into their schedule and you will probably want to make this longer as you get better at it. Do not expect instant results. But you should be in pretty good shape after 12 weeks. If you have a heart monitor, this can be really helpful in maintaining your heart rate at the optimal level but it is not essential for these exercises. As a new mother, you are probably wondering how you are going to shed the extra pounds you put on during pregnancy. For most of us, our belly is the problem area and there is probably a good reason for this. Sit-ups or crunches are probably not the way to go and these kind of exercises may even cause damage to your belly muscles or back. To understand why, we need to understand our abdominal muscles. The Rectus Abdominis is the outer layer of muscles that support your back and internal organs. They are the muscles that create that six-pack look on the stomach. When you are pregnant, these muscles stretch and separate. When these muscles separate, the separation is referred to as Diastasis Recti (separation of the recti muscle). Because this muscle supports your back, this leads to back problems. When the muscles separate, they are joined together by a thin layer of connecting tissue. This connecting tissue is what is left to support your organs. “Mummy Tummy” is the result and your belly is really your organs not getting the required support. Each pregnancy makes the separation easier to happen and generally worse. Certain exercises can help close the separation. The Obliques are the middle layer of abdominal muscles. They run diagonally down the sides of the body. They join with the Recti muscle. Bending forward creates a shearing action between the Recti muscle and the Obliques and can make separation of the muscles larger. Sports like tennis (especially the tennis serve) should be avoided as this can make the separation larger. Most abdominal exercise are aimed at the Rectus Abdominus Muscle. The Transverse Abdominal muscle is the larger, interior muscle and it acts like a corset. It provides most of our core strength and supports our lower back. It also connects to the Rectus muscle. This muscle is used for breathing. This muscle is the focus of the “Tupler Technique“. If you have Diastasis Recti, you will quite likely have a tendency to slouch and have bad posture. There is a strong likelihood that you will have abdominal or back pain whenever you try to lift anything. You will also have a tummy pouch protruding a little too far. Even with all of these symptoms, you cannot be sure that you have Diastasis Recti. You can test to see if you have it by doing the following test. Lie flat on the floor with your back on the floor. Place your hand on your tummy with your fingers pointing towards your toes. You are going to check your tummy in three places. Press down with your fingers on each of the above positions as you lift your head of the floor. Keep your shoulders on the floor. If a gap appears at any of these positions that let one of your fingers settle into it, then you have Diastasis Recti. The deeper the gap, the worse the condition is. If you are diagnosed with Diastasis Recti, there are certain exercises that you should avoid. When lifting objects, bend your knees, not your waist. Carry your baby on your back or your waist. Try to avoid slouching, especially if you are breast feeding. Raise the baby higher if required. Diastasis Recti exercises such as those used in the Tupler Technique will help repair the muscles. Take care to sit up properly from the prone position. Make sure to roll onto your side first and then use your arms to push up into the seated position. Wear a support such as the Postpartum Binder Support. Supports pull the muscles closer together and this helps to heal the connecting tissues. The Tupler technique concentrates on abdominal exercises that train the transverse abdominal muscle, and is designed for mothers who have just had a child and wish to tighten a sagging stomach area. Try to repeat the above exercise three or four times each week. As you get stronger, extend the length of time that you hold each position and add to the number of repetitions. Strengthen the transverse muscle from a seated position. Put your hands on your belly so you can tell that the muscles are going back towards your spine. Now imagine you are bringing your belly button to your inner spine. Hold it there for the count of 30. Count out loud as it forces you to breathe. Now close your eyes and imagine that your belly button is going from your inner spine to your outer spine. It is a little isometric squeeze. After you squeeze remember to keep it at your inner spine. Do 10 of these little squeezes as you count out loud. End with a big belly breath. With proper diet and exercise, Diastasis Recti can be repaired. Do the exercises regularly and properly and you will eventually repair the damaged connecting tissues. In time you will have a tight, firm tummy and if you work really hard, you may even get that six pack you always wanted. If you want to know how to lose baby weight, these exercises can really help you get back into shape again. Repairing the damage will lead to better posture and a stronger back with reduced back pain. You will feel much, much stronger.